The Power of ICU is a proven formula for student success! Every student completes every assignment is an attainable and measurable goal. See what the Power of ICU has done for teachers and administrators in schools across the country. See which conferences and workshops the ICU Team will present at and host throughout the year. Meet the people behind the message. They have a proven formula and one goal – student success. In a Brick House, grades reflect learning, inaccurate feedback is counter-productive, and learning is not a race. We are not presenting a theory of what might happen if you try this. We are watching formerly apathetic students respond dramatically. The ICU Database is web-based so teachers can create, monitor, and manage missing assignments online anytime. 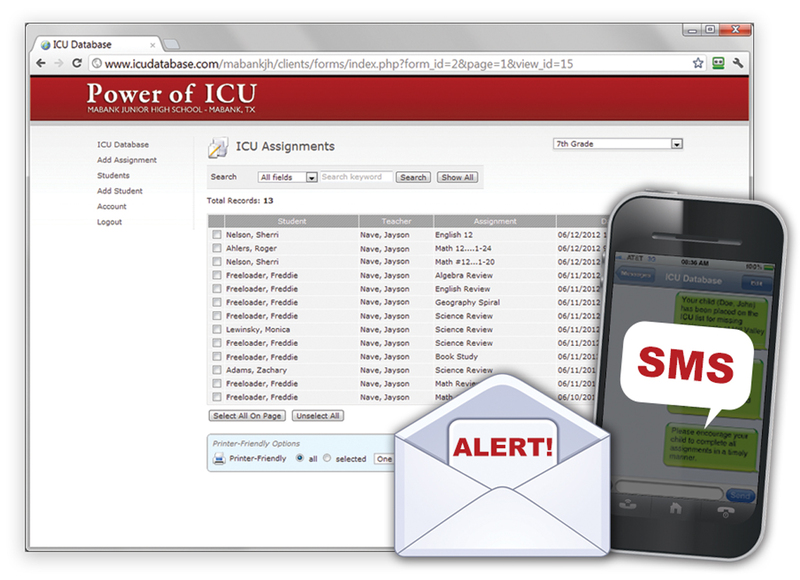 When a teacher puts a student’s missing assignment on the ICU list, the student’s parents are automatically texted and emailed a notification of the missing assignment. Students can be grouped together and viewed in “filters” so everyone can become involved in reviving student engagement and responsibility.